All payments on this site are in Australian dollars through PayPal, at the point of payment you will be redirected to the secure PayPal site. The transaction is through PayPal, Pay Pal is responsible for the integrity of the transaction. You DO NOT have to be a member of PayPal to make an online transaction. To the left hand side of the "LOG IN TO PAYPAL" area, under "Don't have a PayPal account?" click on the "Continue" link, which transfers you to the credit card payment section. Once you have gone through the payment process, the final screen has a large rectangular yellow button, which reads "TO COMPLETE ALL THE TRANSACTION CLICK ON THIS BUTTON" . Click the button to be returned to www.opals-australia.com.au, which completes the transaction. Once the transaction has been completed you will receive a receipt of payment from PayPal immediately, and a web order form from Opals Australia. You will all receive an invoice from Opals Australia with the goods you have purchased, with a record of the Pay Pal transaction number. Payment for purchase of Opal jewelleries from our website can be made either via Paypal or through our direct and secured online credit card payment system. To pay for your purchase via our direct credit card payment system, you will firstly be asked to provide your billing and delivery details, and finally your credit card details on the following page. We accept Visa or Mastercard. The transaction will be verified and completed in real time. 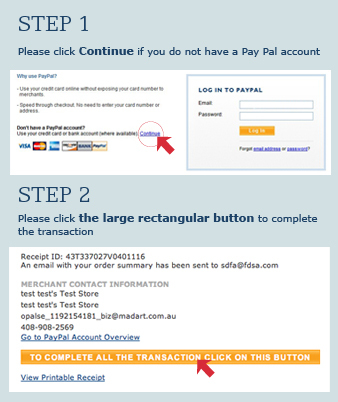 If you decide to pay thru Paypal, you will be redirected to the Paypal site, with their payment system responsible for collecting money for your opal jewellery purchase. You will be protected by the usual security feature offered by Paypal to their users. Please note that it is paramount to press on the button: ìTo Complete this Transaction Click on this Buttonî, in order to be redirected back to Opals Australiaís website to complete the sales. Once transaction has been completed, you will receive a payment confirmation from Opals Australia or Paypal depending on your choice of payment system. An invoice and web order confirmation will also be sent to you. For Australian customers, a 10% GST applies; you may specify a tax invoice be sent to you for taxation purposes.